Peter Wood is an anthropologist and former provost at King's College in New York City. He serves as the president of the National Association of Scholars (NAS). A set of standards, of course, need not mention every detail that a teacher would cover in class, and we can trust that most history teachers would sneak in some mention of the Founders, if only to arm their students with examples of white male privilege on the march. But the APUSH “standards” are, in fact, a luxuriant garden of details. The old AP standards took up all of five pages. The new ones run 80 pages plus a 44-page section that expatiates on the exam. That’s enough text to give a real sense of context. And what it shows is that the new APUSH is highly politicized. It argues for a radical interpretation of American history—one in which figures such as Franklin, Jefferson, and Madison play a drastically reduced part. APUSH was several years in the making and involved consultations with numerous teachers, school of education faculty members, and history professors. Its 2012 release, however, was quiet. Hardly anyone noticed. That changed earlier this year when a retired AP history teacher from Pennsylvania, Larry Krieger, and an attorney with the American Principles Project, Jane Robbins, began to publish short articles on various websites criticizing the new APUSH. In July I published “The New AP History: A Preliminary Account” on the website of the National Association of Scholars (NAS), the organization which I serve as president. And Stanley Kurtz followed up with some posts at National Review Online, including “New War Over High School U.S. History.” Krieger, Robbins, Kurtz, and I have continued to publish further criticisms of APUSH. These have contributed to a grassroots rebellion against APUSH. Legislators in several states, including Texas, called for a moratorium on the new course. 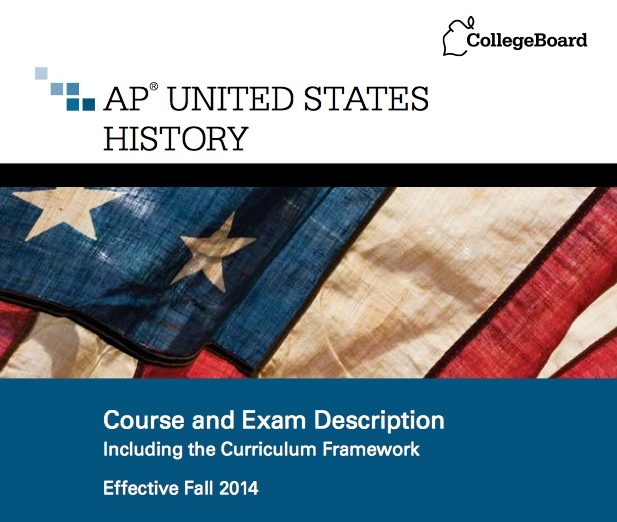 On August 8, the Republican National Committee meeting passed a unanimous resolution calling on the College Board to “delay the implementation of the new APUSH Framework for at least a year,” and convene a new committee to draft a new APUSH. To some extent the controversy over APUSH is a replay of the controversy twenty years ago when Lynn Cheney and Gary Nash clashed over the National History Standards. Nash wrote a book about the dispute, History on Trial: Culture Wars and the Teaching of the Past (1997). The dispute came down to differences between two visions of American history. Nash and his colleagues on the National Council on Education Standards sought to integrate social history with the school curriculum. Cheney noticed the drastic reduction in attention to the nation’s principles and ideals. Nash and company set out to deconstruct American claims to exceptionalism. Cheney and company saw this as an assault on American identity. Nash’s history is materialist at its core; Cheney’s idealist. Technically, Nash won the fight. A heavily revised version of the National History Standards was released in 1996 and went into wide use. But at a deeper level, Nash lost. The credibility of the kind of history embodied in the National History Standards was damaged in the court of public opinion. APUSH replays this controversy but with crucial differences. In the 1990s, there were still plenty of historians who were on Cheney’s side. Today “social history” has solidified into the reigning orthodoxy. When my organization analyzed freshman history courses at Texas A&M and the University of Texas, Austin (Recasting History, 2013), we found that 90 percent of the Texas A&M historians who received their degrees in the 1990s or more recently were race, class, and gender specialists; and among the UT Austin cohort, 83 percent were. Today we have lots of historians who move with ease through the narrative of America as a nation founded on greed, oppression, privilege, racism, and heedless exploitation of the environment. The idea of America as a nation founded on the pursuit of freedom and equality is presented mainly as a myth ever in need of more repudiation. Moreover, Nash has been succeeded by NYU historian Thomas Bender as the leading advocate for turning high school history into a tool for prying American youth away from attachment to their country. Stanley Kurtz has done an excellent work in tracing Bender’s ties to and influence on the College Board, and their mutual efforts, as Kurtz puts it, “to subordinate American identity to a cosmopolitan, ‘transnational’ sensibility.” Bender, the author of the radical La Pietra Report (2000) which called for re-conceptualizing American history as the latest phase of world capitalism, lined up with the College Board in the creation in 2003 if the Organization of American Historians/AP Advisory Board I Teaching the U.S. History Survey Course. In 2004 Bender gave a major address at a College Board event in which he blamed teachers who teach American exceptionalism for furthering U.S. unilateralism. His vision of the right way to teach U.S. history turns on the need to cut America down to size. Bender may be thought of as third in line among the popular debunkers of American exceptionalism. First came Howard Zinn’s A Peoples’ History of the United States (1980); then Nash; now Bender. All three inhabit the same ideological quadrant. They attempt to rid us of what they deem our national illusions and put in place a new narrative. Bender’s approach is captured in the title of his 2006 book, A Nation among Nations, i.e. we are just like everyone else. APUSH embodies this to a T. The course lavishes attention on race, class, and gender grievances and dwells on the picture of America as just another player in the growth of world capitalism. It gives short shrift to everything else. The College Board’s response to the criticism has so far been, “Who me?” We are told APUSH is the work of scholars whose only agenda was to create a good course. This doesn’t ring true. APUSH is hard-edged in its assault on the idea of American exceptionalism, its blanking out of whole eras, and its celebration of progressive orthodoxies. The fight against it is only beginning.